Final Day for 99 Cent Kevin Strange Books! It’s the Final day to get my entire eBook catalog for just 99 cents on Amazon Kindle. At midnight tonight, all books will return to their regular price. Click here to snag the Kevin Strange digital catalog, cheap! Well gang, our Thunderclap campaign is over 50 percent backed! 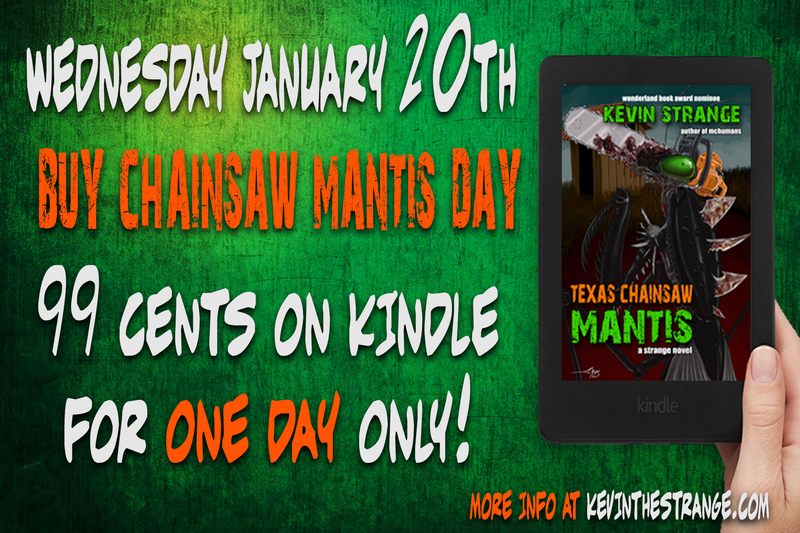 That’s great, but now we only have 5 days to get the rest of the backers or else our “Buy Chainsaw Mantis Day” won’t blast out to the over 100,000 connections we’ve amassed through this cool new social media tool! So we’re asking YOU, the Strangeheads, the fans who’ve already backed our campaign to share this post, share the Thunderclap link (which you can click on right here) and this snazzy new pic announcing the 99 cent sale on Wednesday, January 20th. We’re doing the one day only sale regardless if we’re 100% backed on Thunderclap or not, but how hella cool would it be to blast the word about our sale out to over 100,000 people on social media? ?